flexibility, the ability to change over to a new product. What is the role of disposables in facilities, and to what extent are they used? What are the true benefits of modularization, and where does it have the most impact? Is continuous processing an option, and if so, where and how should it be deployed? Should underused legacy facilities be replaced? In this and subsequent articles we will address those issues. 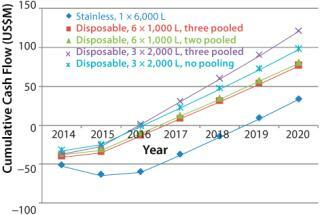 Here, we review optimal strategies for using disposables in hybrid facilities (a mixture of stainless and disposable technologies). In particular we examine the costs of such facilities, their scalability, and their advantages over a reference stainless steel facility. 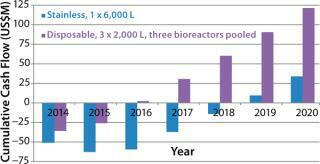 What is the best configuration for a hybrid facility — multiple 1,000-L or 2,000-L bioreactors? 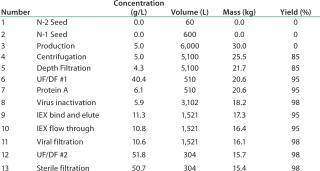 What harvest configuration should be used in terms of pooling bioreactor harvests? How does the best hybrid option compare with stainless steel when changing facility use? To answer those questions, we consider the option that gives the best return on investment. First, we evaluate the scenarios in terms of CoG and more rigorous approaches that take into account cash flow and risk (see “Measuring the Cost” box). sale price constant per dose. reductions in other areas, particularly in terms of capital cost. Our scenario analysis confirms the thesis that as you increase the use of disposables, you are moving fixed up-front costs to activity-based costs (you only spend the money when you need to manufacture). This shift in cost structure has implications in terms of the effect of facility use and risk. A detailed discussion of facility use will be the subject of a later article. Hybrid facilities’ break-even point is 2–2.5 years earlier than those of stainless steel. Delaying the build by a year reduces risk by committing to build only after a year’s information has been received. A hybrid facility has lower capital intensity. In our case, scenario 4 has the highest cumulative cash flow curve and is again the most attractive of all the options. In Figure 2, the most attractive option is compared with the stainless steel facility. The next assessment is translating cash flows into project returns. Table 5 shows that scenario 4 is the most attractive option in terms of highest return. It is interesting to note that if we take this approach, then all the hybrid facility options are more attractive than the stainless steel option. That is contrary to the CoG analysis, which does not take into account the time value of money spent. CoG assumes that $1 spent today has the same value as $1 spent 10 years later, which is clearly not the case. 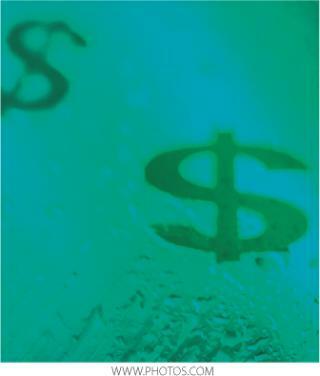 Cost of goods (CoG) is the most commonly used method for evaluating manufacturing costs. It is not the most rigorous approach, and CoG should not be used when there is a need to understand the interplay among cash flows, expenditures, and project risk. in which “Initial Investment” is the cash invested at the beginning of the project (t = 0), t is the unit of time (measured in years), N is the lifetime of the project in years, Ct is the net cash flow for each year of the project, and r is the discount rate, also referred to as rate of return, interest rate, hurdle rate, or cost of capital. For NPV calculations, one of the most crucial considerations is the discount rate. The rate at which future cash flows are discounted to represent their present value is generally based on a required rate of return, which for financial planning purposes is typically the rate that would be expected from an investment of comparable risk. When interpreting NPV, the accepted logic is that projects that have positive NPV values will add value to a company and should be undertaken, whereas projects with negative NPV values should be rejected. a single point in time or may account for the present value of gains/losses. *NPV methodology is the best technique to analyze alternative technologies and manufacturing strategies because it accounts for the impact of delays in expenditures and properly accounts for the time value of money. One question that often arises is the advisability of using disposable bioreactors if required cell-culture capacity exceeds that of the largest disposable bioreactor. Taking our particular case, the simple answer based on this analysis is yes, it should be considered as a serious option. Hybrid facilities offer the promise of faster builds and a more attractive cash flow profile than soley stainless-steel facilities. The disadvantages of using multiple bioreactors are more than offset by increased costs when moving to a stainless-steel facility. This assessment is borne out by the ROI and NPV analyses, which take into account the time value of money and project risk. In part, the benefits seen are derived from lower capital spend, and risk reduction derives primarily from the ability to delay spend and move away from up-front investment to activity-based spending on consumables. This move to activity-based spending provides the an opportunity to reduce costs later during the lifecycle of a facility through joint cost-reduction programs with suppliers of materials and consumables. A final point is that although CoG is a useful tool to assess the merits of a particular process or technology, users must be aware of its limitations. When making strategic decisions associated with new investments, such an analysis needs to include the timings of spend and the relative risk associated with each choice. It is only by carrying out this type of analysis (based on ROI and NPV) that the full economic potential of disposable systems can be understood. Such an approach provides us with the tools to understand and evaluate, capital intensity, the timing of cash flows, and the effect on time taken to bring on-board new capacity. 1.) Sinclair, A, and M. Monge. 2010. Delivering Affordable Biologics from Gene to Vial. BioProcess Int. 8:16-19. 2.) Langer, E. 2009. Trends in Capacity Utilization for Therapeutic Monoclonal Antibody Production. mAbs 1:151-156.